I'm having a problem in that the two big humps on the shoulders (the top two pieces of the model) I can't find in the big .zip file. Any way I can get you to tell me what they're called, or if they're not in the zip file, to upload them? The "Thing Files" tab has visualizations of each individual part. The ones you're looking for are Shoulder_Blade_L and _R. the 3d model contains errors and need to be fixed. some slicers might know how to slice it but not all. I had a look at the STL files for one of the pieces and like Erdrick writes it is composed of different parts. the "base plate" is a solid object but the detailes on top of it are are not solid, all the details are missing the surface towards the "base plate". the slicer wants a solid object without holes to understand what to do. Second best is that every part should be solid, no holes no mater how smal. Also if you have a model containing several objects make sure they don't overlap because at least some slicers counts every surface as going from outside object to inside object or the other way around. so if you model two cubes and overlap there corners your print will have a empty space in the overlapping area. could be do to the slicer thinking those blocks are different objects and are trying to create supports for them rather than connecting them as one single object. If you open up the stl in blender I believe it will show them as two separate non connecting pieces. You could try using another slicer, or if you're skilled enough you could attempt to remove the touching faces and connect the blocks. I saw similar problems when my extruder drive wheel/roller wore out. Have you seen this problem on other parts? Any chance anyone has tried to scale this down to 8 mm/AT scale? 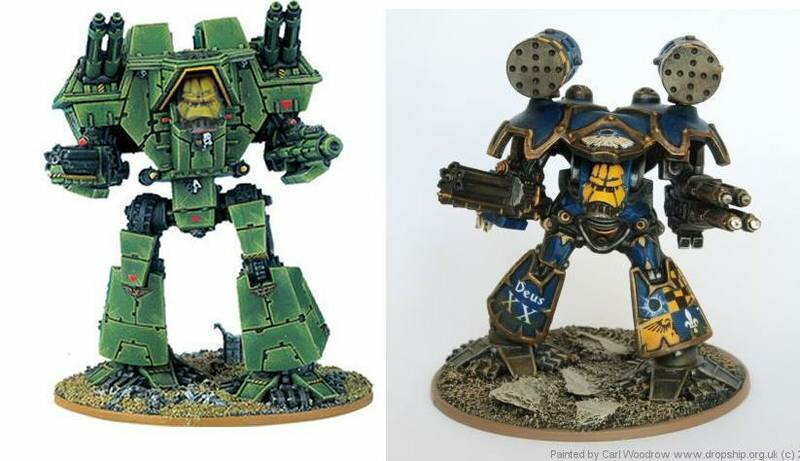 So, I'm also new to printing, and have done the math and have determined that, for my purpose, the starting cost of a 3d printer will never outweigh the fact that a single Warlord titan is $600-$2000. That being said, would you know what the largest single part is? I'd prefer to keep the digital hack saws to a minimum. If you don't it's fine, but I really don't want to look through 145 files to determine size. The largest part is Core.stl. Im new to 3d printing, and am looking at getting the Ender3 as my first printer. Is that printer big enough to print all the pieces to this model? Im currently 1/3 of my way through printing one myself, any chance of different weapons choices ? Power fist, chainfist, gattling blaster ? 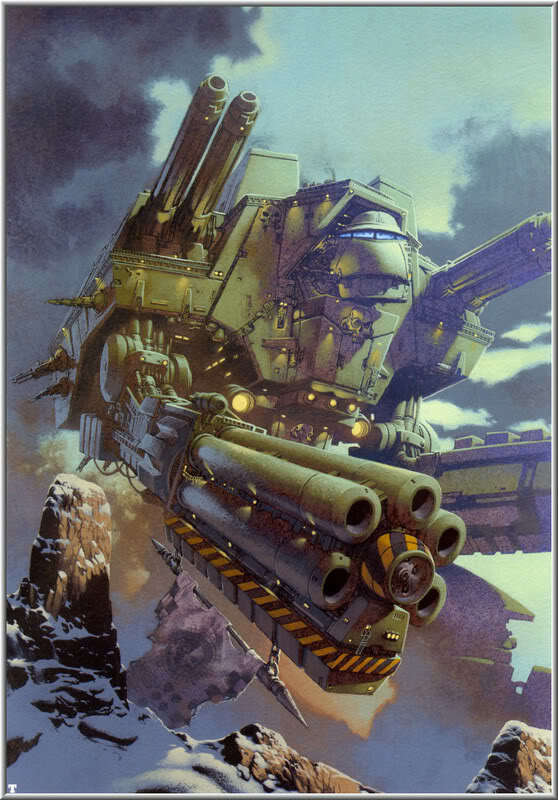 Is there any way to cut this thing up and make it into a proper 28mm 1/58th scale? It's amazing, but that would make it pure perfection. So, I'm part way through printing this (will post a make once she's printed and painted) and just realised something marginally disappointing, the catwalks and doors... They're far too small for a standard (what even is the official scale?) sized model to stand on or use... 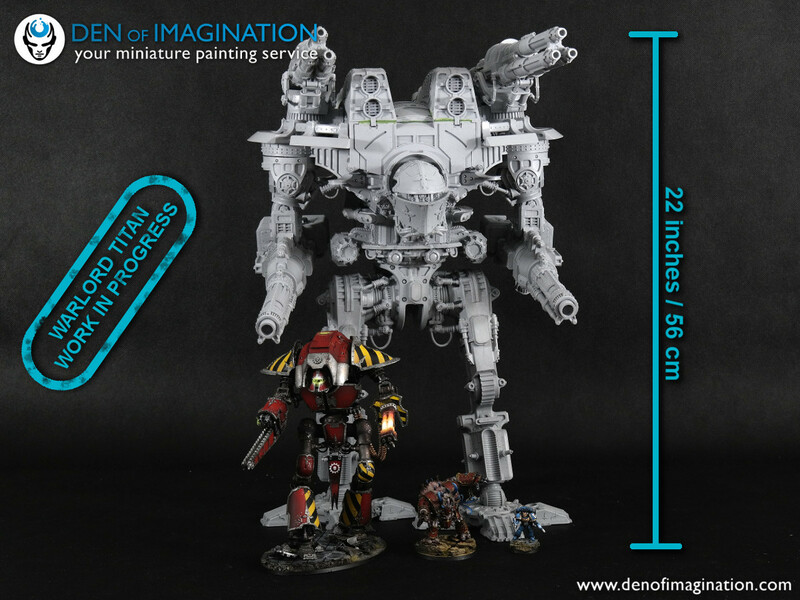 Even if this were scaled up to be the size of an emperor titan on table, it wouldn't be large enough... Still loving the print and learning a TON about my printer (considering this is my first major project) and printing in general, cheers for the work cutting this! However, it still works for 28mm 40K. All of the tiny doors become maintenance hatches instead, large enough to get an arm in to work on something but not large enough to crawl into. The large doors in the armpit region could work as ingress/egress hatches. The catwalk is a bit out of place, but you can simply leave it off. True, but the hatches I'm referring to are about the size of a model's head. That really stretches the suspension of disbelief that is usually applied to other vehicles. hey just a quick question? you didnt make this right? an identicle model in full size was posted 2 months earlier then this one? just wondering because... i mean all the licenses are changed? if you did make it yourself then no problem! awesome work either way thank you! he sliced the files into components and patched errors. and added things like the triangle slots to hold it together. had an issue with the shin. i think it was because it was actually 4 parts trying to be done at once. so i went into 3dsmax and pulled it apart and fixed a few poly errors. printed all 4 parts with no major issues, except forgetting to put support/everywhere on for the triangle hole. I am not sure why nobody has had this problem, but it may be my machine/and or settings. but will include the file for anyone who might have this issue in the future. i did the head first to get an idea of size, and only had a problem with support clean-up. overall i think this is a fantastic model and will post any future files to help us newbs out. keep up the good work. Hi, i've been struggling with this ankle for a while, thanks for the fix! i don't suppose you have the file for the opposite side too please? What kind of issue did you have with the shin? My machine didn't want to print it as one piece. It printed the disk, with the recess for the ankle joint first, then tried to print the joint, which it couldn't do with the recess. is there something wrong with the head file? I printed it and I got layer shift in about 6 different places. nothing is wrong with my printer the bands are all tight ect. Will reprint and see how it goes. Would love to get started on this. Whats the largest part? Any pointers on the bed size needed? I am about 90% done with mine and other then a few little problems with the shins I have not had any real problems with it. It is a beast of a model and it has been absolute fun to build. Is there a full model available for rescaling and use with EPIC? I don't have one, and besides it would not be practical to print this model for epic scale. When going that small there is too much detail that no extruder could handle. Best option would be to try other titans that were designed for epic scale. I love the work you've done with this. Or even more, if someone added servo placements etc so you could actually make it move. How cool would that be?! Been thinking of doing that, but will require major adjustments or remakes of joints. Also going to redo some of the upper to make it hollow for weight reduction. Have already redone the main foot bottom so there is no separate piece between it and the toes. Absolutely incredible work! I'm just starting out, 20 minutes into the first piece. awesome work, but as site note with 3 foot 91cm the model is to big. thanks for this! great job! You do realize this is undersized for 28mm play. I have seen one that claims to be to scale, and it's feet each fill a barstool, yes he had it standing on 2 barstools. Perhaps for a puny Mars Pattern. The Tech priests on Lucius know how to make a real God Engine of War! You are right. I went back and checked the model. It Is 650mm / 25.5" tall. This is very nice,I have a question if it is not to much trouble, roughly how much material is needed to print this? The whole print took roughly about 3(1kg) rolls. Yeah I do not have good planes to print from seems like the flat surfaces aren't. I am also getting a lot of floating parts in the raise reliefs. So far it really hasn't stopped me but I am also wrestling with the size of the shoulders and warping. I tried to slice the lower shoulder down to reduce the long edges and give myself a good print surface but Meshmixer isn't playing nice with the file either. You are correct on that. I had to use rafts for some prints. But even with the unevenness, everything fits together as it should. So is the a coupling between the frontplat and the head or are the pistons the only thing holding the head on? The pistons are the only thing holding the head on. Which is confusing because how does anyone get into the head? what is it's full height? printed the head of the warlord and a few settings were just out, will reprint as the detail eagle on the head didn't come out. Still looks awesome.....will be printing for awhile on this one. Full height is about 3 foot ish. Approximately, when arms and weapons will be released? what weapons you think to make? Bellicosa volcano? plasma/melta cannon? Saturnine lascutter or others?? Someone made a weapon and new head, but no way to mount them to this model unfortunately. I should be done with the arms/weapons in about 2-3 weeks ... ish. Give or take. I don't know a whole lot about 40k. Mostly I am doing this for a friend, and then am sharing the joy with the public. Hello Erdrick, again many thanks for that work. May I ask you for one. I am not realy happy with the cutline in the Shin Parts. I can see about fusing the 2 shin parts for you. There really isn't a left or right on this as you can print the right one, and then mirror it to make the left. So if I can get this done you will get 1 shin and then you can mirror it to make the other one. Looking great. Is there anything we can help with? Actually I am getting pretty close to being done. Right now I need to finish printing out the torso bits, and make sure it all goes together properly. Then the last thing I need to do is slice the guns. Better get myself printing then. I feared this project was abandoned so hadn't started yet. Looking forward to it. I so look forward to seeing it and printing it. gotta ask, whats the height of those legs in the pic? Height of the legs are roughly 370mm / 14.5"
Width spans about 450mm / 18"
With each foot being about 220mm / 8.5"
This is fantastic. Have begun to print this. Looking forward to see the rest of this beast. Amazing Work and thank you for that, pleaso go on and do not Stop. Dude, this project rocks! Thinking I am going to make to print the whole thing when it's finished. Great job!